Heroes of the Storm has two ranked play modes: Hero League and Team League. Depending on how well you do in a season you earn rewards. Presently, players are competing for 2017 Ranked Season 1 Rewards. Your peak rank determines what rewards you receive. While I have finished my placements for both modes in Team League I believe I have fluctuated between two different tiers, but want to be sure. Is there a way to determine my peak rank prior to the season changing over? You can find this information in the Statistics-Tab in your profile. 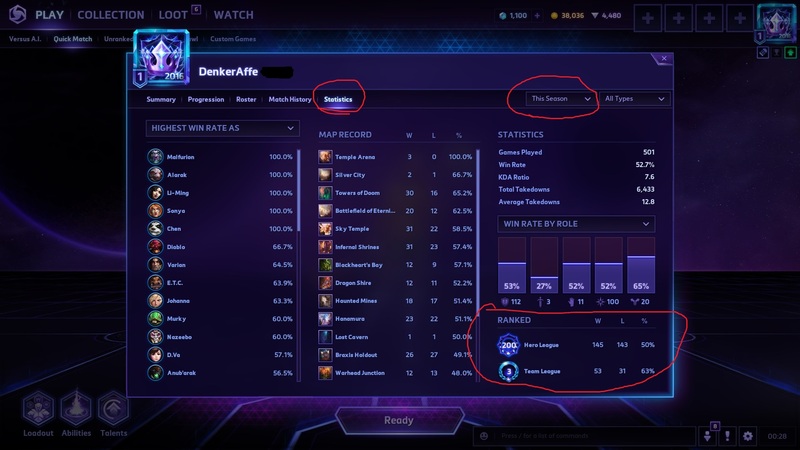 Just select a season and then you can find your highest ranks in the bottom right corner.